We were alerted by our colleagues on the North Coast that, after a long respite of no activity on the Richardson Grove front, there are things happening behind the scenes, in the courts, and in the County Supervisor’s chambers. 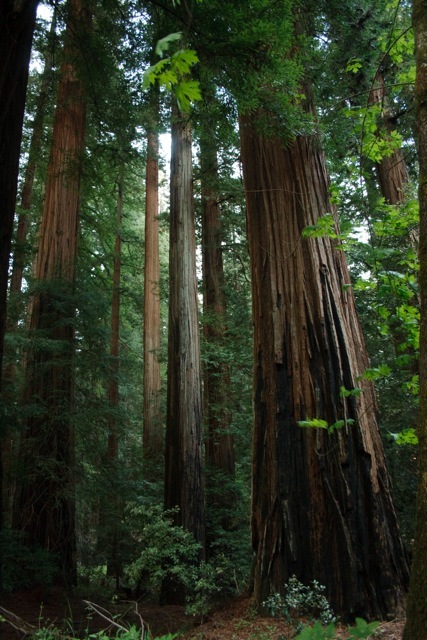 Most of you will remember that Caltrans’ backward-looking ruminations for bigger, faster roadways yielded a plan announced over a decade ago, to widen and “realign” Highway 101 through the towering ancient redwoods of Richardson Grove State Park in southern Humboldt County. That plan, controversial from the beginning, has been litigated, its premise debunked and protested, culminating in a decisive court win by the environmentalists against Caltrans in federal court in 2012, and withdrawl of all their permits 4 years ago. But it has become the boondoggle the agency won’t let go of, and Caltrans is making another run at it. They released new documents last year, but there has been no activity to speak of, beyond rhetoric…until now. 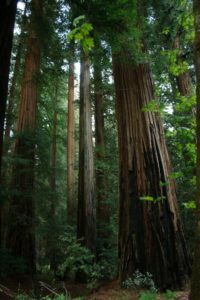 Also being considered at this time is a proposal to lower the speed limit for vehicles traveling through the narrow, windy roadway that is abutted by giant redwoods in Richardson Grove. The speed reduction is proposed for a short section of highway where the mammoth trunks come right up to the roadway, and is one of the ways to address the proximity of the road to the ancient and vulnerable trees without highway expansion. A speed reduction has been proposed many times over the years by opponents of the Caltrans project, but this time it is proffered by Caltrans. It is not clear what they are up to; the proposal will be heard by the Board of Supervisors on April 3, again in Humboldt County. Contact us at BACH for more information on any of these hearings. While far away from most of those on this list, good attendance at these forums is making a difference! I traveled up to Arcata in February to represent the Bay Area Coalition for Headwaters and Earth First! at a meeting of a newly-launched alliance—the Pacific Alliance for Indigenous and Environmental Action (PAIEA). Some of the many issues discussed by this enthusiastic group of individuals and organizations for mobilization include the uptick in the use of herbicides in north coast forestlands, the removal of a statue honoring Pres. William McKinley from the Arcata Plaza for McKinley’s role in destruction of Indigenous cultures and the earth, protection of old growth forest in the remote Mattole River watershed, and a ceremonial Log Walk to Heal the Forest. It is a dynamic and diverse alliance, and we invite any other BACH-associated persons (or otherwise) to travel with us when we go north for meetings. Please be in touch with our phone or email if you are interested. Action update: Several days after the meeting, a group from PAIEA joined Humboldt University students and other residents for a strong showing at the Arcata City Council, following a march and demonstration, urging them to finally remove the McKinley statue. The Council voted to do just that! Stay tuned for further updates on threats to redwood and other native forests, rivers and species of the north coast, including the Mattole watershed, as well as action alerts about more local activity.